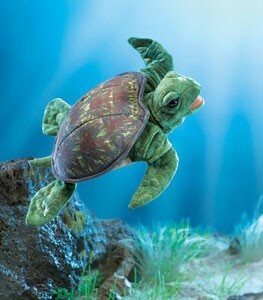 Folkmanis 3036 - An ancient marine creature, the SEA TURTLE puppet is beautifully rendered with patterned shell, scaly-looking body fabric and suede cloth underbelly. Her wise eyes and movable mouth tell the story of her ancestors as her front flippers propel her to the depths of the sea and your heart. Movable mouth and front flippers. Puppet measures 16” x 14” x 3”.